This entry was posted on April 8, 2016 by Rob Penta. At iAmmo.com, we believe that every gun owner should keep a record of all of their firearms and other serialized items in the event of theft or loss. 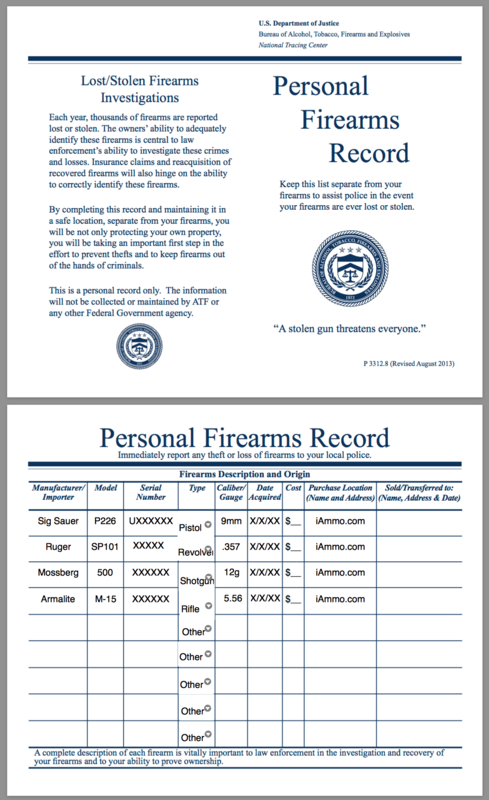 Similar to the FFL books that we keep here at the company, every iAmmo.com and NetBallistics employee keeps a Personal Firearm Record of all of their personal firearms or other serialized items. This practice not only helps you keep track of what guns you have in your personal possession, but it also makes reporting a lost or stolen firearm much easier should you ever find yourself in that unfortunate situation. 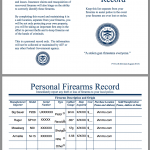 Luckily, the ATF has made this process very easy for anyone to do by providing a sample Personal Firearm Record on the ATF website that can be filled in and printed. This useful document can be found at https://www.atf.gov/file/4831/download . Here is a screen shot of the sample document. We hope that you found this helpful, and remember to visit iAmmo.com for all of your needs relating to firearms, ammunition, and shooting sports.